KICKER and SSV Works deliver great tunes on the trail. 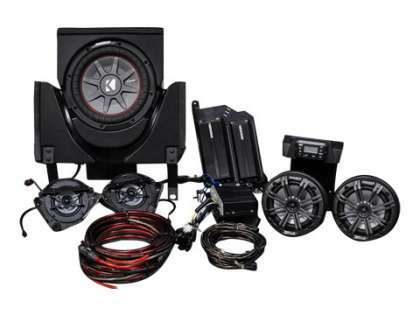 This complete plug-and-play, five-speaker system is custom-made for your X3, right down to the wiring. To get tunes to your system, an SSV Works receiver is included, delivering AM/FM and Bluetooth connectivity to two KICKER PX-Series powersports amplifiers. These weatherproof amps give you 800 watts worth of juice for plenty of volume on the trail. For mids and highs, a set of KICKER KM-Series weather-proof speakers are mounted in a pair of custom SSV Works under-dash enclosures. The enclosures fit in the factory locations, and include special acoustic lenses to improve the sound quality. Another set of SSV Works speaker pods with KM speakers are mounted above the rear seats on the cage for even more volume and sound quality!